Hello lovely readers! I am checking in today with some more pictures of my sweet baby girl. 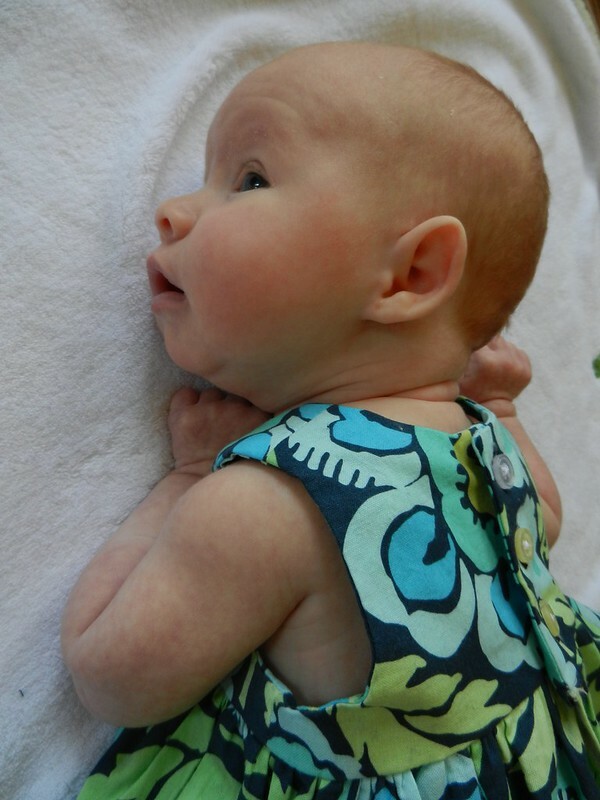 When Caroline was born I think I waited about 15 minutes before I started making a mental list of what I wanted to sew for her. The first thing on my list was the Geranium dress from Made by Rae. I love Rae’s patterns (especially the Washi which is my most made pattern!) 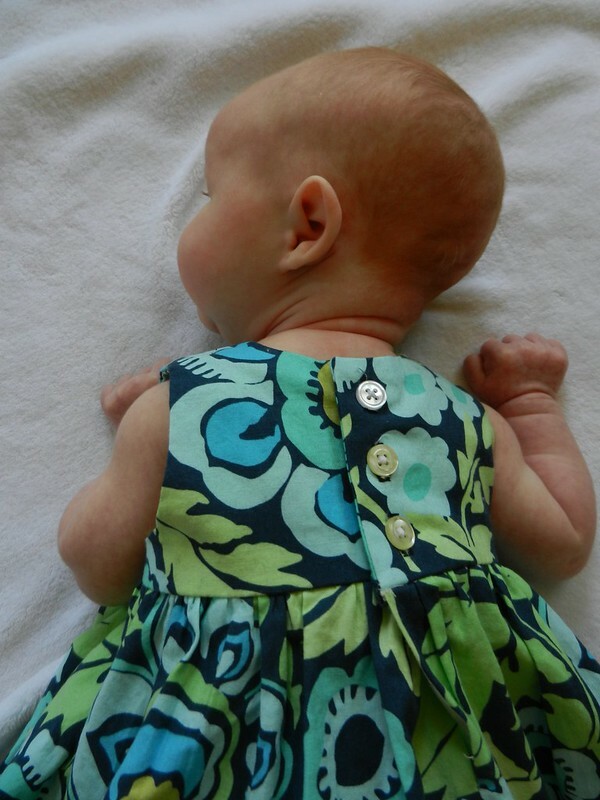 and I was really excited to finally be able to make one of these darling dresses. 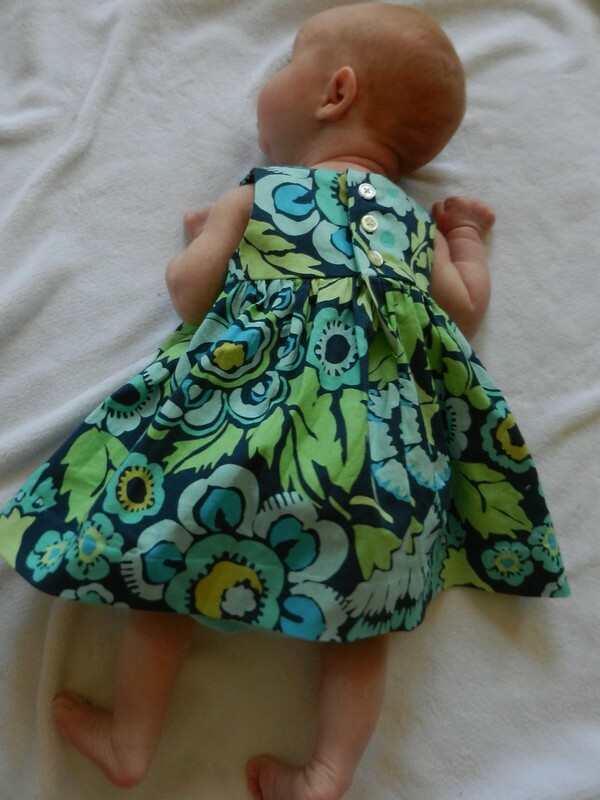 Rae offers the 0-3 month size free on her website so a few days after we got home from the hospital I downloaded it and made Caroline’s first dress. It was only this past week that I finally put it on her to wear on Easter. I love how it looks on her and I can’t wait to make more of these as she gets older. I used some Amy Butler fabric that I’ve had in my stash for a really long time. I had about half a yard left over from another project and it was just enough to make this dress. I also made a coordinating diaper cover with a solid turquoise fabric that was also in my stash. I used the free tutorial from Dana Made It, which was super easy, super quick, and looks adorable with the dress. The buttons on the back of the dress just kill me. I think it is crazy adorable (even if my buttons are two different colors! Oops!) Sewing tiny dresses is just so much fun and it’s really satisfying to be able to use small cuts of leftover fabrics that are languishing in my stash! 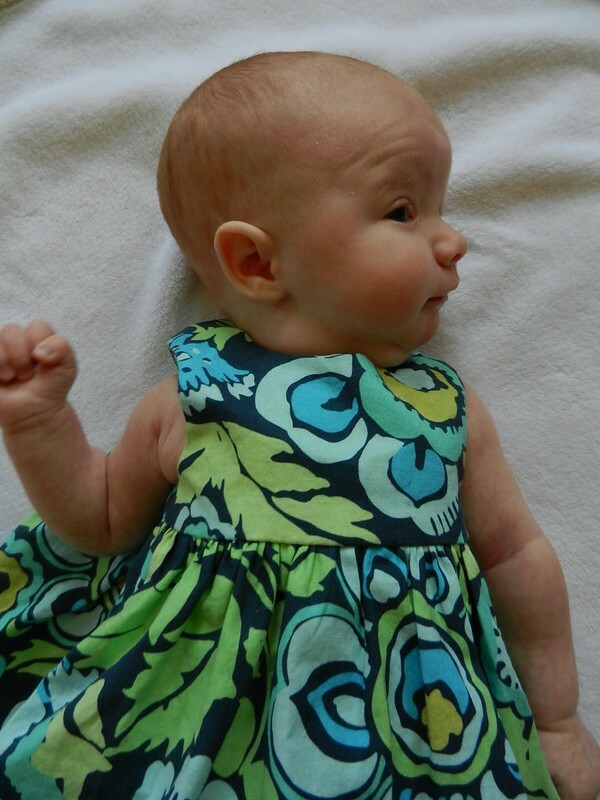 I really enjoyed sewing this dress and I know there will be many more Geranium dresses in Caroline’s future. Be back soon with my Easter dress! Thanks, Fiona! I just love her to bits! Thanks, Kirsten! I’m so glad I got to put the fabric to use finally. OMG! Teeny baby with teeny tiny Geranium Dress! Squeeeeeeal! So cute. This is a great pattern, you’re going to love sewing it up in all the sizes. Thanks, Teresa! I’ve started saving lots of pattern ideas on Pinterest! Such a sweet dress for such a sweet baby! She wins Best Dressed Baby, for sure! Awww, thanks Tracy! I’m working on her outfit for her Christening now– I can’t wait to see her in it! Oh, those teeny tiny baby hands and feet just slay me! What a sweet dress. Nice that you can use up some leftovers like this! Thanks, Lisa! When she is awake she’s usually kicking her legs and swinging her arms so it was kind of a challenge to get photos where her hands and feet weren’t a blur! This is so adorable!! Sweet little Caroline! 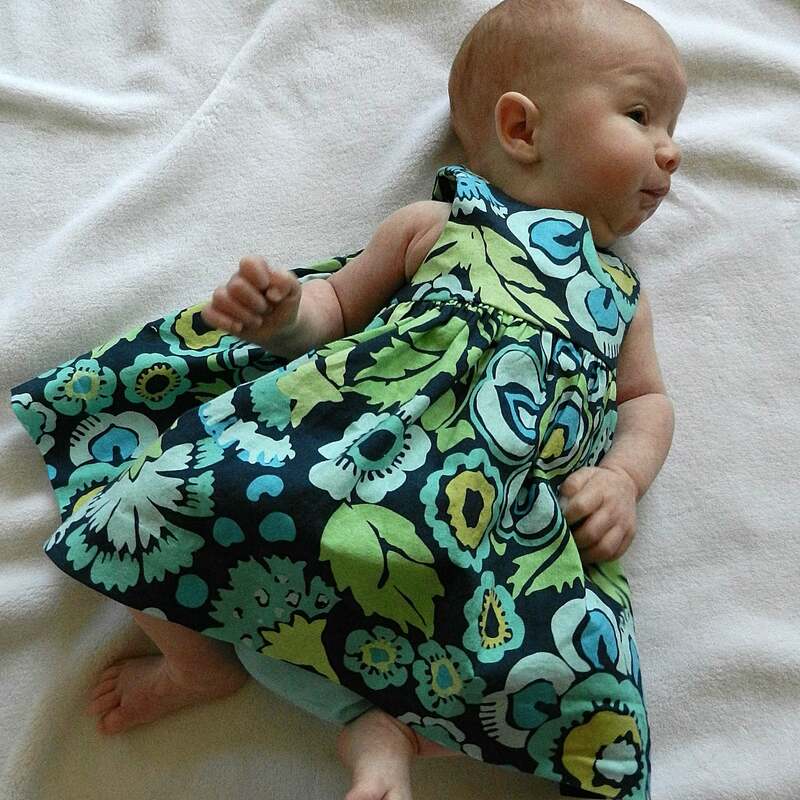 Hooray for you to finally have a little girl to sew little dresses for! I can’t wait to see more! Thanks, Heather! I love sewing for my boys, but I’m super excited to be able to sew little girl clothes now! so adorable, and the dress is very cute too 😉 sewing for little girls is so much fun,, I love the button detail too. Thank you so much! You are the queen of pretty dresses so that means a lot to me! !